Two suspects in the alleged plot to blow up as many as 10 trans-Atlantic airliners were released without charge Wednesday, Scotland Yard said. Britain's Press Association reported that the first man released was Tayib Rauf. An official with Britain's anti-terrorist unit confirmed that Rauf, who was videotaped at a grocery story in Birmingham just hours before he was arrested Aug. 10, was released. The official talked to the AP on condition of anonymity because he is not allowed to talk to the media. The identity of the second person released was not disclosed. Meanwhile, detectives will again ask a British judge Thursday for more time to question one remaining suspect being held in the alleged plot to blow up as many as 10 trans-Atlantic airliners. The suspect, Umair Hussain, is part of a group of nine people who are still being questioned in the plot that British officials said was thwarted earlier this month. He could be further detained, be charged or released. Hussain made a similar appearance Wednesday, and his custody was extended by just 24 hours. His lawyer, Timur Rustem, told The AP that he believed Hussain could be released, but said it would be the judge's decision. "I think I may be able to see him face to face on Thursday night," he said. On Wednesday, a British court extended the time the nine suspects can be held without charges being filed. Mohammed Nazam, the owner of the grocery store where Tayib Rauf was taped and a friend of the Rauf family, also told The Associated Press that Tayib had been released. It wasn't known where Tayib was Wednesday night. Scotland Yard said it would not comment and a call to prosecutors was not immediately returned. Tayib's brother, Rashid Rauf, is being interrogated by law enforcement authorities in a town near the Pakistani capital, Islamabad, over his alleged key role in the plot, officials said. Pakistani officials have linked people arrested there in the alleged conspiracy to al Qaeda militants. Investigators have not revealed if the alleged airline plot suspects were linked to al Qaeda. In the days immediately after the Rauf brothers' arrests, a swirl of attention focused on their role in the plot. Their father, Abdul Rauf, immigrated to Britain from the Mirpur district of Pakistan several decades ago, and his five children were born in Britain. Rashid was arrested in early August along the Pakistan-Afghan border, and Pakistani officials dubbed him a "key person." British authorities released precious little information about the brothers, or the course of their investigation into the alleged terror plot in general. Police said eight suspects who have not been charged could be kept in custody until Aug. 30, giving police more time to quiz them about the plot they have said involved liquid-based explosives. The 11 were among about two dozen people arrested Aug. 10 in police raids in London, Birmingham and High Wycombe, about 30 miles northwest of the capital. The others arrested have either been charged or released. Wednesday's court action represented the first time that police have used new anti-terrorism laws to hold suspects for more than 14 days without charge, Britain's Home Office said. The law lets officers make applications to hold terrorism suspects for a maximum of 28 days before filing charges. 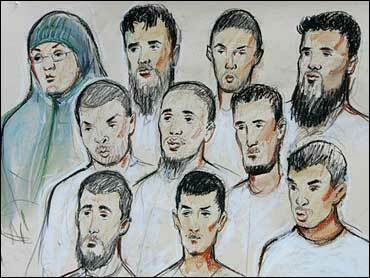 Eleven others charged in the alleged terror plot appeared before a court for the first time on Tuesday. Eight of the men charged were accused of offenses of conspiracy to murder and preparing to commit terrorism. Three others — including the mother of an 8-month-old — are charged with lesser offenses, including failing to disclose information. British detectives are attempting to stitch together thousands of pieces of information to demonstrate that they thwarted a major terror plot. Meanwhile, experts tell CBS News correspondent Sheila MacVicar that the bombs the suspects were allegedly trying to make might not have worked. Sources close to the investigation tell MacVicar they believe the suspects were trying to make acetone peroxide. But this chemical has a strong smell and is very unstable — sensitive to even small rises in temperature. Would-be bombers may not have been able to keep the solution cool enough, experts say. Officers on Wednesday began searching for evidence in an area of woodland in High Wycombe, a police spokeswoman said. Months of surveillance had produced "significant video and audio recordings" regarding the alleged plot, London's anti-terrorism police chief Peter Clarke said Monday. He said investigators had found bombing-making chemicals, including hydrogen peroxide, as well as electrical components. More than 8,000 items of data storage, such as compact discs, DVDs and memory sticks, were found. Maps of Afghanistan, suicide notes and books on explosives also were seized, officials said. Investigators said the evidence was still being examined, including fingerprints, DNA samples and handwriting. British officials also confirmed that the plot involved the manufacture of liquid explosives, which would then be assembled and detonated on board airliners.